This is an attempt to start a weekly series where I look at unusual shot charts and post them here. They balance out over a season to what a team wants to do, like Houston straying away from mid-range shots, but unusual shot locations can emerge each game. It’s why I wanted to start a weekly series as long as it doesn’t turn out messy or jumbled. Detroit’s allowed the second-most attempted corner threes per game, 7.3 according to NBA.com, and that’s where Miami teed off from last Sunday. Detroit either over-helped or fell asleep, some of that being expected when LeBron James bends defenses until they break. There was one instance, though, where James directed every Heat player on the floor to the left side, save for Ray Allen, and Detroit didn’t adjust. It was one of the easiest corner threes of Allen’s career. 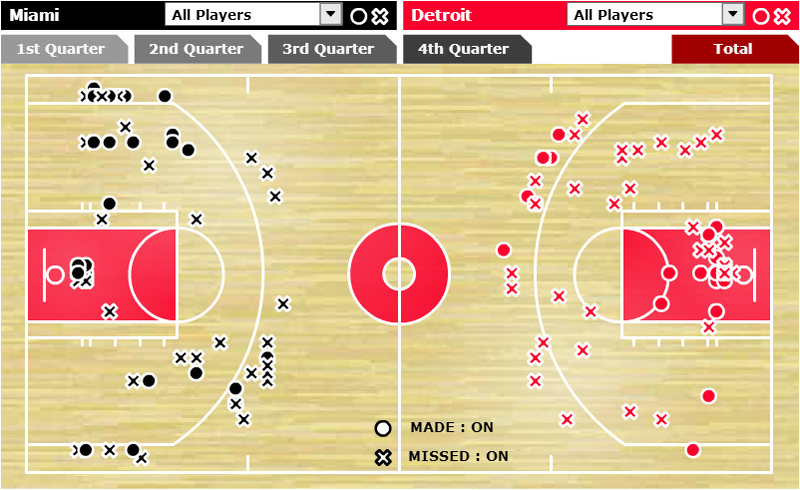 As for Detroit’s offense, they bricked all but one mid-range shot. Give credit to Miami for the bad offense on a ton of possessions, though. They forced more than a few difficult passes, ones off course just enough to where shooters spotting up for three had to take a couple steps inside the arc to catch the ball. The Pistons are actually in the bottom-five in attempts from both the 10-14 foot areas and 15-19, according to NBA.com. That’s a little surprising when Josh Smith is on the team, but not so much when Greg Monroe and Andre Drummond start at power forward and center, respectively. Miami bagged the win, 110-95. The Suns missed all of their attempts from the left side while hot from the right side, at least from the elbow down. The Morris twins were responsible for most of the mid-rangers in that hot patch on the right side, while Goran Dragic made two of the corner threes. The Suns won 114-108 and continued a start to the season that was hardly expected. This was perhaps the ugliest game I’ve watched all season. 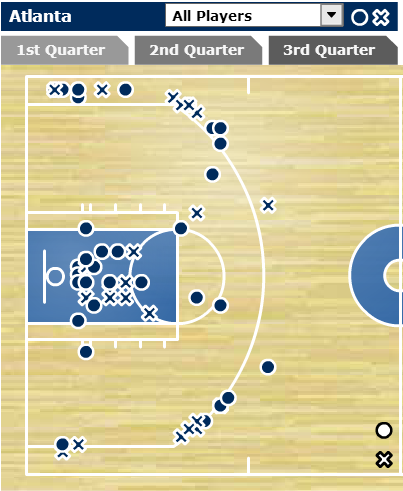 The Knicks took a ton of mid-range shots, especially from above the elbow, and shot only two corner threes. 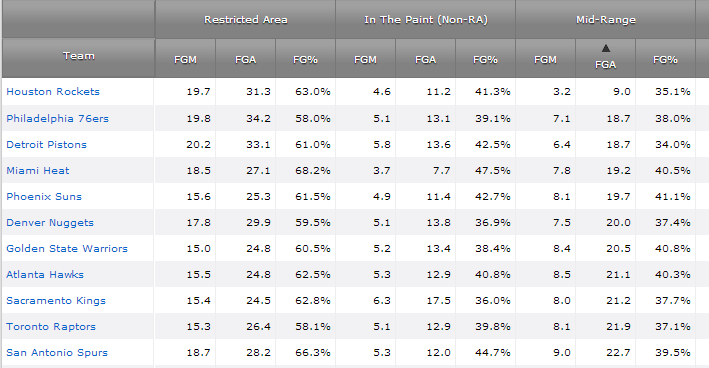 For the season, they’re in the top-10 in both mid-range shots attempted and above the break threes, but in the bottom-10 everywhere else. The Knicks won, though, 83-78. Perhaps my favorite game of the season and definitely one that put Portland on the national spotlight if they weren’t already there. It was a contrast in styles. 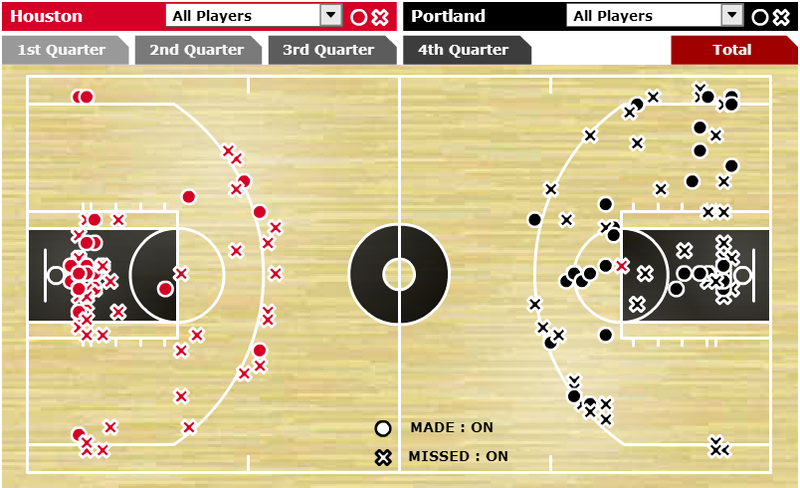 Both teams like to tee off from the arc, but Portland takes three times as many mid-range shots per game than Houston. In fact, every other team takes at least twice as many as the Morey Ball-Rockets. 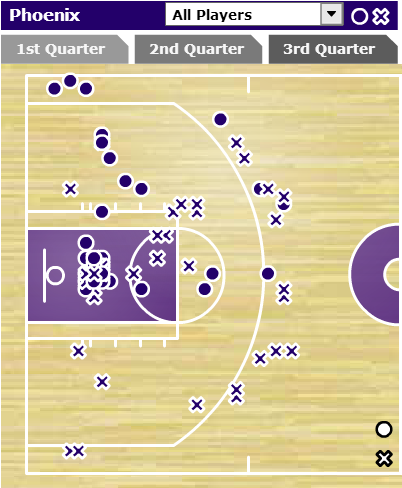 LaMarcus Aldridge didn’t care, draining a of those mid-rangers in the chart above. Portland won, 111-104. 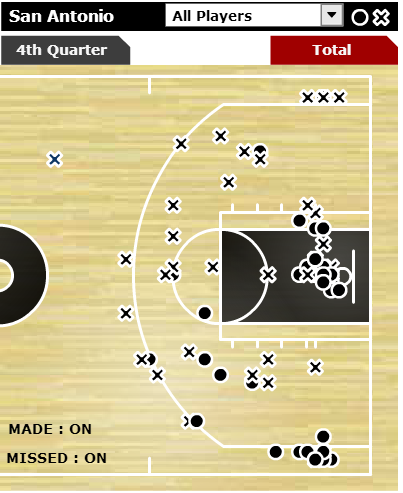 The Spurs really enjoyed that right corner three, a total of seven shots made from there. It’s just too hard to win games when your opponent scores over 20 points from the corner like that. 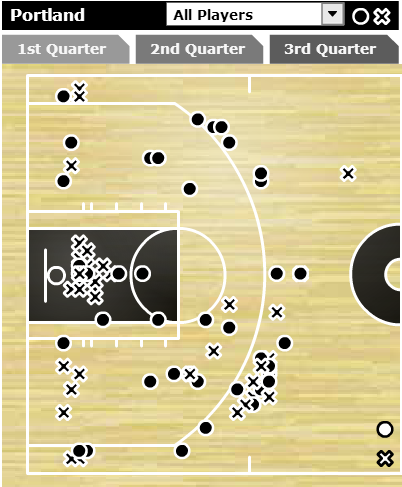 Three of those corner threes came in the fourth quarter when the Spurs outscored the Timberwolves 37-21. It was quite the answer to Minnesota outscoring them 35-18 in the third, thanks to Kevin Love’s three-point barrage. 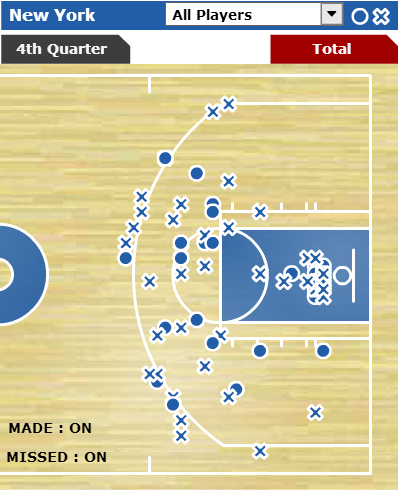 Another Morey Ball shot chart. Barely any mid-range shots were taken, with a ton of those shots instead going towards threes, including a bunch from the corners. Atlanta took 32 attempts from the arc that night, making 15. 10 of those came from Louis Williams and Kyle Korver. The Knicks still won, though, 111-106. Maybe they’ll trade for Kyle Lowry after all. Portland had a night reminiscent of when my rosters on NBA 2K6 had ratings of 99. They couldn’t miss (21 threes), they dished (41 assists), and they won in a blowout (139-105). Had the Trail Blazers scored one more point, they would’ve been the 11th team in league history to score 140 points while taking less than 20 free throw attempts. Regardless, they set a franchise record with their made threes. It’s just not fair when a team takes nearly 40 shots from the arc and makes over half.